I try to find the balance between the stillness and the movement, the meditative and ecstatic. It’s this lovely dance, and that’s the sentiment that I hope to characterize in my work. Visionary Artist Michael Divine joined Editor-in-Chief Seth M. Walker for an in-depth conversation about his work and journey as an artist. The provided examples of Michael’s work display how his paintings transcend psychological and spiritual boundaries to uniquely engage the mystical and archetypal. Hi, Michael. Can you tell us a little bit about yourself and your background as an artist? I first started painting when I was 18; of course, I’d been drawing all my life, dabbling with various tools: pen and ink, watercolor, pastels, etc. I’m not sure why I started working with acrylics, though. They certainly seemed easier to pick up and play with than oils and, as time passed, I found they were far easier to travel with. In those first few instances of painting, though, it was largely a mess. Were there any particular themes you explored while finding your niche as an artist, or did you draw and paint a variety of subjects? Once I discovered that I really loved to make art, I pretty much followed a path that continued along the exploration of imagery of forms and shapes inspired by what I knew. As I saw more, both internally and externally, my vision expanded. I think it was over time that it evolved into something with more mystical and spiritual inspirations. In my late teens, it was a lot of following my tangents (sort of stream-of-consciousness drawing) and seeing where that would lead. I think that, rather than finding a niche, it was always about finding my own voice and making art that made me happy; I would see that it made others happy as well, so I figured that I had to be on the right track. You know, I want to add that, at the time, it was pretty much the infancy of the internet, so I really didn’t know that anyone else was making anything in this vein. I didn’t even know that such a niche existed. That’s a tough one. When I was much younger, I think it was likely the ability to create worlds in which I could lose myself, whether it was dragons and knights or comic book characters. Later on, I found psychedelics, which, coupled with a propensity towards the spiritual, seemed to help unlock a vast library of imagery just sitting there in my mind just waiting to be tapped. Do you feel psychedelics play a crucial role in unlocking this imagery, or were they simply functional in this regard during that time? Functional… that’s a funny word. A hammer is functional in a certain way, a useful tool to have for a very specific purpose, and I think that psychedelics are equally functional as useful tools for unlocking the mind/heart. I think that, in my early 20s, I found them especially attractive because they helped me to see much further than I’d ever been able to see from the borders of my suburban upbringing. They helped to introduce me to concepts and ideas: the oneness of life, the necessity of compassion, of wisdom, etc. I have wondered before, would I paint what I paint today if it hadn’t been for psychedelics? I’d say probably not, and it’s not that I wanted to paint “visionary art” (or ever knew such a thing existed). They helped to open up the possibilities; they showed me what was possible for the mind, for my imagination, for my heart, and in general, for humans and life: that it really is all love. Almost anyone who has had a transformative psychedelic experience will tell you that. Regarding the metaphor of tools, psychedelics are like keys that unlock a whole host of things; as well as unlocking the pretty pictures, they also help to unlock the psyche, help you confront your demons, shed light on the dark corners, and deal with things that are difficult to do with the normal, conscious mind. Once these things are seen or experienced, it’s up to us to maintain the vision, but that’s another story; that’s the practice. I do not. I wonder sometimes what I would be like if I did. My parents weren’t too keen on art school, it didn’t seem like I’d get a good job, so I ended up studying comparative religion in college for a couple of years. Of course, comparative religion is, ironically, a field of study with even fewer job opportunities. I loved to draw, though, and was soon pursuing an interest in painting on my own time. At the same time, in college, I had a job in the Fine Art Library and was able to peruse a collection of slides and images of every major and thousands of minor pieces of art from both the East and the West. I think that stimulated my imagination quite a bit. I was especially taken with the work of the Futurists – Boccioni’s “Dynamism of a Soccer Player,” for instance – and the stream-of-consciousness approach of Kandsinky, especially in his Composition paintings. At the time, I really enjoyed finding parallels between developments in modern art and the developments in world religion at the turn of the century. It’s quite fascinating. I feel like some of my early paintings were heavily inspired by the things I saw and studied then. I left school after two years, though, to paint: to go be an artist. To be perfectly honest, while I did spend a vast amount of time through my early and mid-20s teaching myself to paint, much of the rest of it was spent traveling, partying, dancing, hiking, and exploring. While I certainly learned a vast amount about myself and people in general in that time, I’ve wondered what would have happened if I’d sought out a painting teacher or art school of some sort. Ah well, it was a colorful adventure. Those parallels at the turn of the century do sound quite fascinating. Can you tell us a little bit more about what you discovered? One of the interesting things, I think, and something that doesn’t get talked about much in art history, are the mystical explorations of a lot of the artists of the late 1800s and into the 1900s, which is really the birth of Modern Art. They were heavily influenced by a wealth of Eastern texts that were translated into English and German for the first time: the Dhammapada, the Upanishads, the Bhagavad Gita, the writings of Confucius, just to name a few. Up until the mid-1850s, when Western art began to take some radical new approaches, artwork was primarily one of four subjects: portraits, still-lifes, scenic art, and religious art; however, it was always very objectified, very object-oriented. Western art has this thing about placing the subject front and center. To make some broad generalizations, Eastern art tends to be more spacious: the objects that make up the piece seem to dance around the space and are framing that space. In the end, the work of Hokusai is as much about the subject matter as it is about the space that the subjects frame. Inevitably, this finds its roots in the spiritual traditions of the place. Eastern mysticism is primarily concerned with all this stuff about ego and breaking down the self. There are many, many interpretations, and many can seem at odds with each other but they all seem to run counter to the Western Christian approach where Man is here to have dominion over all things. I think that’s a really interesting shift in point of view, and I think it’s equally important when we consider the changes that happened in art at the time. Impressionism was an attempt to create more non-objective artwork, for instance. Along with the Impressionists, of course (and those who followed), was a whole host of heavily mystical artists like Frantisek Kupka, Jan Toorop, Jean Delville, among many others. They had their occultist societies – Theosophy for one – where they found themselves blending the ideas and philosophies from these different religions. But all of this is just the precursor for what eventually has transpired. Surrealism was a great leap in that it was an art where its methods were based in traditional forms (paint, brushes, studies of light, etc. ); however, the artwork stemmed from the imagination (primarily the subconscious) and explored these dream-like states and these strangely juxtaposed forms and ideas where the artist was working at expressing something that was based on the relation of the subjects that the artist chose. The work of the surrealists, I think, set the stage for the Visionary Art movement that would follow, creating artwork that stems from a personal vision within one’s own psyche. I could talk at length about this, and have, about the mystical underpinnings and roots of Visionary Art and how it was really born out of these early explorations and such. Where do you draw most of your inspiration from when creating a new piece? Mostly it just comes from living life. I’ll have a flash of an idea or see a conjunction of objects that inspires something in my mind, or I’ll be considering some emotional process or something I’m going through in my life. Along the way, I never know what may come up. It is in the process of living life, of doing mundane things like going for a walk, going to the beach, doing yoga, talking, reading, etc., that the finer nuances of an idea becomes known. Does the creation of a new painting come rather spontaneously, or do you have a formal process in place for beginning a new piece? There are several approaches really: smaller paintings are usually approached more casually and, sometimes, fairly spontaneously, while larger pieces are much more methodical. For the larger pieces, I really plan them out quite a bit. I give a lot of time to making sure the elements are all in the right places. I make drawings and sketches, planning much of it out, but I can never plan the whole thing because I love the spontaneity of the creation. I like having a direction but leaving space for tangents and new inspirations to arise. As far as the technical process, though, I sometimes apply thick colors to the canvas, and sometimes I just work with sepia tones over which I later build up colors with various glazes. Do you have a favorite place to create, or a particularly inspirational setting that you find to be most conducive to the creative process? Well my studio, of course. A good studio – with good light and ample space – is a gift. You have been recently engaging in “Live Art.” Can you tell us more about this? I used to shy away from painting in the “live” setting, that is, creating a painting at a concert or a festival in front of a whole slew of people. Because I’m such a fan of the studio, I like working at my own pace. I am often a very careful painter, sometimes taking hours at a time on just a few square inches. That’s not much fun to watch, I think. I also used to be much more self-conscious about people watching me while I worked; what if I messed up? Lately, however, I’ve been more into live painting because I’ve found a better flow and rhythm. To me, live painting makes the most sense if I have a plan when I go into it. I consider the image I want to make, the key components, and how long each will take. There’s spontaneity of course, but there’s also a lot of conceptualizing beforehand. The final process, the performance as well as the finished piece, I think, allows people to see the start-to-finish creation of a painting (from raw canvas to something that closely resembles a finished piece) and has that resounding pop at the end: the a-ha moment. That’s the part that really makes me the happiest with that process. It’s like a musician playing a long extended musical exploration of something that comes to a peak eventually, and it’s familiar but fresh and exciting. I like that part of the process quite a bit. Although there is still a considerable amount of planning and conceptualizing that goes into both studio and live art, would you say one of them contains a bit more spontaneity than the other? I’d almost say that the painting in my studio contains more spontaneity because it’s where I can experiment with new ideas, and if the new idea ends up taking all day – or ten days – then there’s no rush; there’s no pressure to work it out. Think about a musician: when you go see some band live, there may be spontaneity, but there’s a lot of careful planning and working off cues of one another. They are very well-practiced and well-rehearsed. They can get to their peaks and riffs because they know how to get there. Sure there are moments of new ideas and flashes, for them anyways, of truly spontaneous co-creation, but it’s still in a rehearsed framework. The studio is where the real spontaneity and experimentation happens, I think. If you had to characterize the sentiment underlying your creative process, would it be either meditative or ecstatic, or would it fall somewhere in-between? It would certainly fall somewhere in-between, and I think my work shows it. There are great explosive parts and then these intricate areas, which you can’t rush through at all. I try to find the balance between the stillness and the movement, the meditative and ecstatic. Life, though, is like that – now it’s slow, now it’s fast, now it’s full of movement, now it’s very still. It’s this lovely dance, and that’s the sentiment that I hope to characterize in my work: this lovely dance. Would you say this in-between characterization – this dance – sort of parallels the studio-live dynamic as well? Sure. The live setting helps to stretch me as well, and I certainly love to leave my hermit cave, so to speak, and go out into the world and play. So it’s good to get out, to paint live and let my brushes and paint flow in a much looser manner because then I’m so happy to be able to give myself the time and space that the much more careful paintings require. There’s a story (and I think it is in many cultures, but for this I’ll paraphrase Buddhism) where a new monk wanted to meditate, and he worked really hard at it and held himself very, very still. He fasted and prayed all the time, non-stop. The monk had been a musician, and he went to his teacher and asked why it was so hard. His teacher asked him about his stringed instrument: if the strings were too tight or too loose, you couldn’t get the right note and it could not be played. So it is the same with the practice: too loose or too tight is no good. We must find the right path between the two. As an artist, too much studio time and you lose the looseness, but too many parties and live painting, and you lose the focus. It’s the dance between the two where there is joy. Are there any artists or works of art that have been especially inspirational to you throughout your career? There are so many artists really, so many works of art, and they’ve all informed my work in their own ways. Sometimes, I think that the unlikeliest of pieces can be the most inspirational. I find myself inspired by work that really captures something – David Alfaro Siqueiros’s “Echo of a Scream” is one such piece. It’s dark and disturbing, and when I saw it in person at the Museum of Modern Art in New York City, I felt like I’d been hit in the head with a lead pipe. That’s powerful art! Obviously, my inspirations aren’t all so dark. Here are some of the most notable artists I find inspiring: the early modern artists like Vassily Kandinsky, Umberto Boccioni, Gustav Klimt, Alphonse Mucha, and Frantisek Kupka; the great Surrealists like Salvador Dali, Max Ernst, Rene Magritte, and Remedio Varos; some of the great illustrators from the turn of the century like Kay Nielson, Harry Clark, Edmund Dulac, and Arthur Rackham; and then, of course, modern day visionaries who came out of the 1960s and 1970s like Mati Klarwein, Ernst Fuchs, Erich Brauer, Martina Hoffmann, Robert Venosa, and Alex Grey. I have bookshelves with several hundred art books, and they are filled with gems and inspirations. Are there any particular books you’d recommend? One book that inspired me quite a bit is The Spiritual in Art – Abstract Painting 1890 – 1985, which is a great survey of modern art and the mystical underpinnings. I mean otherwise, I have dozens and dozens of art books. They’re all great! Do you have a favorite artist or work of art? There’s so much that’s been inspirational to me, but I do have some pieces that have kind of stuck in my mind over the years: Dali’s “Hallucinogenic Torreador,” Boccioni’s “Dynamism of a Soccer Player,” Frantisek Kupka’s “Irregular Forms: Creation,” and almost anything by Mati Klarwein. What about your own work? Do you have a favorite piece? A favorite piece is probably “The Glass Onion.” I used to think that I didn’t have/couldn’t have a favorite; how could I pick just one? But there’s so much that went into that painting, so much careful thought and understanding and process, that it really stands out for me as something exemplary. Another favorite is “Limits,” which I painted a number of years ago, and while I’m certainly a more developed artist now, it exemplifies something for me: a moment in time, who I was, where I was at. I’d say that my favorite pieces, and probably the best work I’ve done, crystalizes a part of me; it’s something deep and archetypal and human, yet carries with it these very mystical components. One of my favorite paintings is your “Birth of a Star” (2010). I’d love to hear more about this piece and its conception. Quite a while back, I think it was 2002 or 2003, I did a ten-day Vipassana retreat. It’s a rather long time to sit with oneself. There were ups and downs and all sorts of things, of course. It was a very transformative and illuminating experience. By the end of it, after I’d dug through all sorts of layers and identities, all I could see and feel of everything was this rippling blue flame that surrounded me, and it was very loving and sweet and that’s all everything was. I felt this field, this energy, and it might as well be called love, but it was everything burning away. So that stuck with me and I thought about that part often, that everything is just sort of rippling away, yet we grasp after it all the time. Quite a while later, I was driving through Sedona, Arizona, in the summer and admiring the way the intensity of the green grass and the red rocks all worked together, and I thought about that image again and decided I wanted to explore it in a painting. I made a number of sketches while I worked out the look and feel of it. Then I finally was ready to begin the painting; the canvas was prepared, etc., but I couldn’t find my sketchbook. So I went on memory. It changed some, of course, in the translation at that point. Ultimately, though, it’s very much about this heart-opening experience and this bright point of light, this nameless, seemingly indestructible truth that is born out of the nebulousness. That sounds like an incredibly powerful experience, clearly depicting an intersection between that “propensity towards the spiritual” and those “finer nuances” you mentioned earlier. How has your background in comparative religions influenced this type of work? Would you say your formal studies opened you up to this exploration of the mystical and archetypal, or did they further stimulate interests of yours that were already present? They helped give me a language to speak about it. My main reason for that course of study was to answer some of my own “personal inquiries.” For example, I wanted to know more about Buddhism, but Buddhism is a vast subject with countless schools of thought (not much different than Christianity, really) and the best way, I felt, was to take a survey course in Buddhism. Through that I was introduced to all the different vehicles, terminologies, etc. It helped push me in certain directions. The same is true for studies in comparative religious experiences. It helped to give me a framework for my own understandings. I think we are lost without words; we can have these experiences, but to speak of them, to try to understand them, we need words. I think what was great for me too was that, while I left school after only a few years, I had a trajectory – I understood some of where I was coming from and what I was seeking out in my desire to understand things. I could go into bookstores and find what I was after or talk with people and have a vocabulary to understand and discuss certain things. Your work is self-proclaimed to explore what you call the “inner worlds of the psyche and the heart” and the “journey of growth and transcendence through the inescapable phenomenon of human existence and conditioning.” Can you tell us more about this? Ah, this inescapable phenomenon… You know, we humans have this human condition that brings with it a certain framework – it has its attachments and aversions, its opinions and ideas, and all the conditions we place on the world around us and the conditions placed upon ourselves. We perceive the world in a certain way through a very specific set of inputs and process it with a set of conditions we call Ego or Identity. I think the possibility of growth through that phenomenon of human existence appears, and the inner worlds we create along the way (our ideas about how things are, our archetypes and dreams, our desires and ambitions and sadnesses – all of these things) paint the world around us in a certain way. I feel that what I paint and how I go about painting it challenges and explores all of these things. I am, in many ways, very much a Taoist (heavily tinged by Buddhism, I suppose, among other things): there is the way, the path of least resistance. There’s so much that we do that seems counter-intuitive to that, but great art like love, like joy, like sadness, can’t be forced; it has to arrive at itself through an authentic process and its own natural rhythm. Because I am, at least for now, in this life, working through the lens of the human mind and body, I want to create art that speaks to that process, is of that process, and ultimately, expresses the deeper harmony of the process. This sounds very much akin to some of the aspects you noted about “Live Art.” Do you feel as though it has the ability to allow this to happen in a way that studio-produced art cannot? In that it cuts through the process? Yes, at times. I think that’s why I enjoy it. It’s more of a no-thought kind of experience. I don’t want to think about what I’m doing. I just want to do, and if I really enjoy the music I’m painting to, then that helps quite a bit too. How has your work changed over time, from, for instance, “The Cosmic Womb” (1999) to “The Glass Onion” (2011)? That’s an interesting choice of two paintings. Certainly there’s a sizable span of time there. 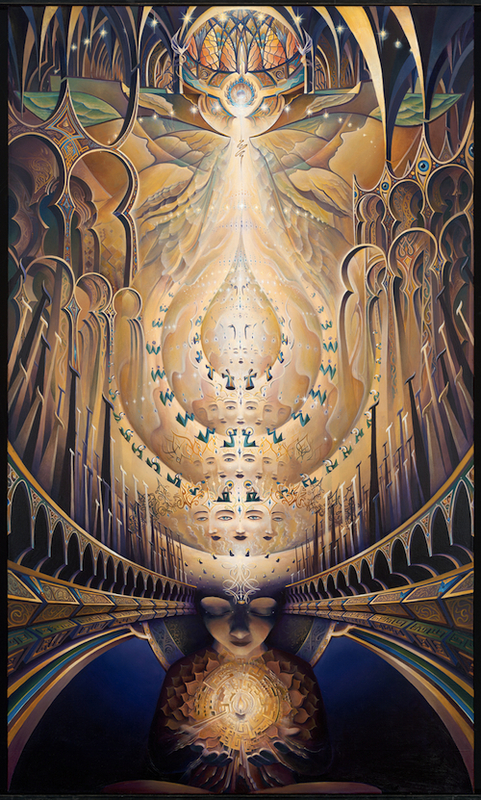 Right around the time of painting “The Cosmic Womb” I had come to the realization that I was fooling myself with this idea of transcendence, that everything would be greater, higher, than that which came before it, and there was this thing to rise above, to transcend ego, form, boundaries, etc. There is no transcendence, though. There is only this, but even still, as an artist, especially as an artist without any formal training, I had something of a slap dash approach: everything was trial and error, and I was really working hard on understanding that. I also took far longer in the creation of a painting and was not nearly as efficient. Now, today, I have a far more efficient approach. I sort of know what I’m doing, and I also have a different sense of what I’m creating. As time goes by, it continues to be a more and more personal experience. Would you say it is more and more personal because of the evolving content, or because of the maturity you’ve developed as an artist? Or, do you mean that works such as “The Glass Onion” explore much more personally transformative themes than some of your earlier work? I would say the former. When I was younger, I was excited for all this transcendence, and then I realized one day that that was all illusion. There is no transcendence. There is only here/now, and so it moved much closer to home. The artwork, the creation of it, the subject matter, it continues to get closer to home. I grow and change and mature over time, hopefully, and in doing so, my artwork, I hope, reflects that. Not every piece reflects this change, but the much larger works especially tend to do so. They take so much time that there’s a certain amount of devotion and dedication to the process. It’s a dedication to personal process as much as creative process that I’ve been able to nurture and have more patience with over time. I think that it comes through quite a bit when I look at my work and how it’s changed between ten years ago and today. Is there anything that you have found to be particularly challenging throughout your career? You know, being an artist always has its challenges. There’s the challenge of business, of finding the time through the early career to build a body of work that shows a commitment to the practice. Then there are the challenges of modern life: the million and one distractions. Of course, the most challenging thing, I think, is my own mind, all of its self-doubt, illusions, distractions, and chattering. This, however, I think, is the challenge of life: to find one’s way and to find the right way through that identity illusion. Right now I have a 48” x 32” canvas on my easel that is a commissioned piece for a collector of my work. While it’s currently untitled, it is of the Wheel, the cycle of life and death, or an interpretation of it, in any case. Where can our readers view or purchase your previous work? All Paintings By Michael Divine 2001-2011. 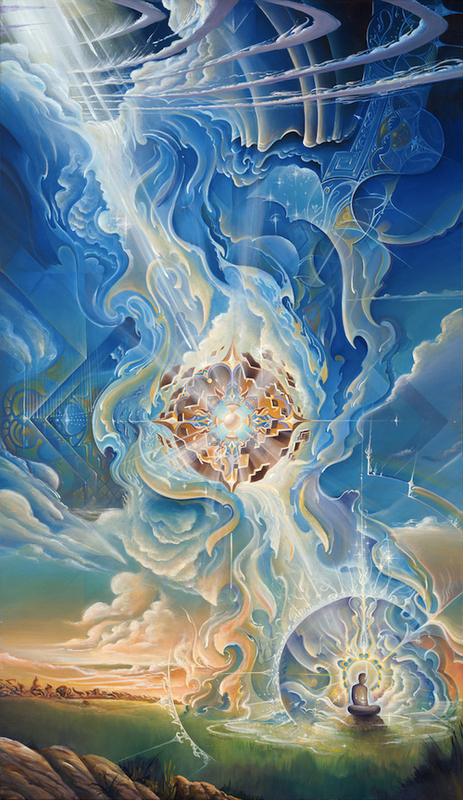 Michael Divine is at the forefront of today's Visionary Art movement, exploring fundamental human archetypal experiences and a vibrant personal mysticism through his breathtaking and well-crafted imagery. From Wassily Kandinsky’s intuitive balance of line and color to the bold movement of Umberto Boccioni to the psychologically informed landscapes of Salvador Dali, Michael’s work follows in a long tradition of artists who base their work on their interpretive visions. While he spent much of his early career traveling and honing his craft, today he divides his time between intensive studio work and giving presentations, live painting performances, and participating in art shows throughout the nation. He lives in Southern California with his wife Violet.